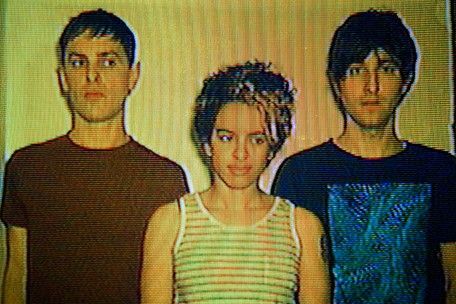 Portland, Oregon’s The Thermals have carved out a beautiful niche in the punk-pop world over the last 10 years, but it hasn’t always been the easiest road to glory. The band has seen more than their fair share of line-up changes since their start in 2002, but original members Hutch Harris and Kathy Foster seem to have finally found stability with drummer Westin Glass. Still as if change was necessary for their survival, the band shook things up a couple years ago when they left venerable indie rock label Sub Pop to sign with Kill Rock Stars and release their fourth studio album, Now We Can See. Now We Can See was produced by John Congleton (Explosions In The Sky, Polyphonic Spree, and was a bit of a re-birth for the band. Still, much of what made the band successful was and still is very present – raw energy and enthusiasm, great melodies and catchy hooks, sing-a-long chorus, and smart lyrics exploring everything from life, death, religion, and politics. Not wishing to lose any of their new creative momentum, in 2010, The Thermals teamed up with Death Cab For Cutie’s Chris Walla to create their fifth studio album, Personal Life. Both songs in this session are featured on that album, and as Pitchfork.com says, they are "pretty damn catchy!" The is is the second time Laundromatinee has been lucky enough to film and record with The Thermals. Watch our first session with the band here. Lvoe the Thermals. Great to see them a little less frenetic than in their regular videos. Still some great passion.